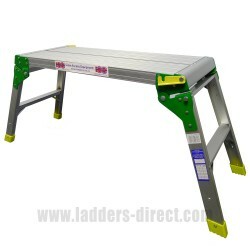 Hop up & work platforms (also known as step platforms) are ideal for work at a short height where platform step ladders may be unsuitable due to their height. Their extra large work platform provides greater stability and ease of access for smaller tasks around the home and workplace. Hop Ups There are 4 products. Clow Hop Ups offer handy and useful work platforms which can be easily manoeuvered and stored. 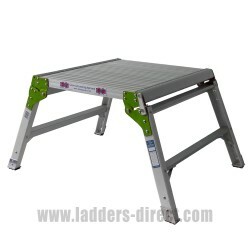 Ideal for quick, safe access to low level working heights. Maximum load 150kg.Volume Discounts Available* Availability: In-Stock. With a large stable 600 x 600mm aluminium platform, strong heavy duty hinges and aluminium legs the Clow Glassfibre Step Bench provides a platform height of 480mm. Maximum load 150kg.Volume Discounts Available* Availability: In-Stock. 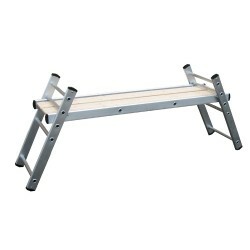 With a large stable 600 x 600mm aluminium platform, strong heavy duty hinges and aluminium legs the Clow Aluminium Step Bench provides a platform height of 480mm. Maximum load 150kg.Volume Discounts Available* Availability: In-Stock. The ideal solution for both professional and amateur decorators - 3 different heights, lightweight, safe and easy to assemble. Availability: In-Stock.